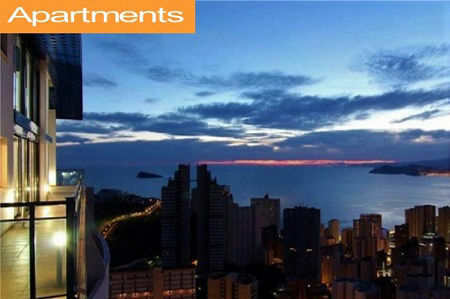 Book the very best top selling low-cost budget hotels in Benidorm for cheap holidays and affordable short breaks in Spain. Choose from some excellent hand picked top quality Playa Levante 2 star hotels or for a cheap as chips weekend in Benidorm, choose form a range of basic, hotels and no-frills simple Bed and Breakfast Pensions and Hostals. The emphasis here is on affordable great value rooms. 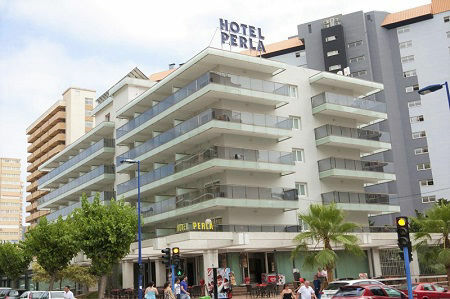 Best selling 2 star hotel for cheap Benidorm holidays. Guests return here every year, many several times each year! Home from home dining, English breakfast is on the menu. UK TV Channels in rooms. Large pool/ sun terrace. Overlooking harbour, park and beach. This is a 5 star location at a 2 star price. 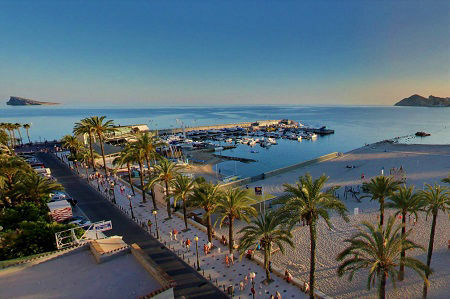 Ideal for a relaxed week on the beach and enjoy all the old town has to offer. Simple rooms many with sea views. On the beach! Always busy so book early for sea view rooms. A popular medium size 2 star hotel with lovely new rooms and guest areas recently revamped (2017) to a good standard making this one of the best low-cost hotels in town. 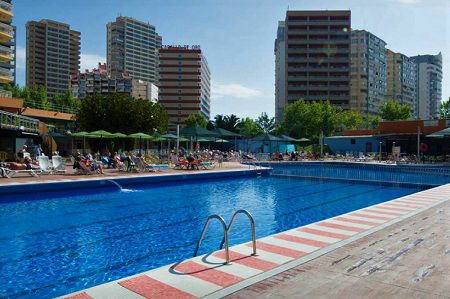 The right location for late, lively cheap Benidorm holidays. Always popular with small groups. 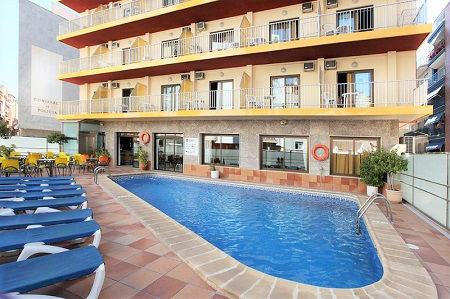 A welcoming and friendly, small simple two star hotel overlooking the Poniente beach right in the old town. Choice of standard sea view rooms with balconies or rear economy rooms, pay the extra for a sea view! Bang in the old town center. 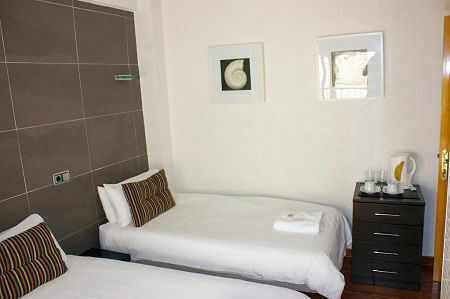 Small friendly low cost B&B 2 star hotel in the very heart of the old town. Cosy little rooms. 100m from beach, restaurants, bars. Popular for singles and couples. Late and Lively area. English Breakfast. A great holiday spot bang in the heart of the busy "casco antiguo" overlooking the big shopping street in the center of Benidorm old town. 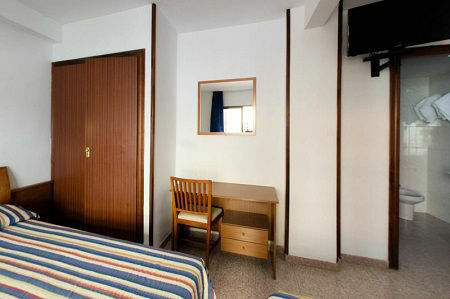 This 2 star low-cost, no fuss small hotel offers simple rooms. There is a courtyard cafe bar. Just 70m from the beach. 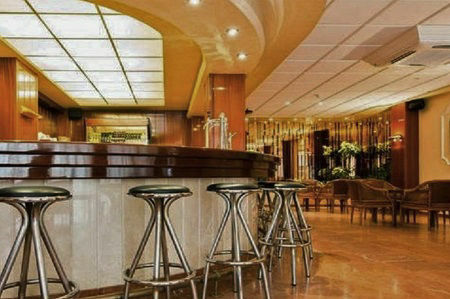 Hotel Brasil 2 Star located in the old town in a busy residential area surrounded by café bars and shops. Offering a small pool, cafeteria and lounge bar. Guests will find simple rooms, good size balconies. Good value town center hotel. Good for singles. 200m from the Levante and Poniente beaches! Popular value choice for singles on a budget and looking for a good base to enjoy the best of the old town. A simple 2 star hotel in a lively area. OUR CHOICE: Just off the main shopping street. 95% of all guests love this nice little friendly B&B hotel. Get a Free soft drink mini-bar, free room safe, good free wifi and yummy coffee. Only 17 rooms book today! 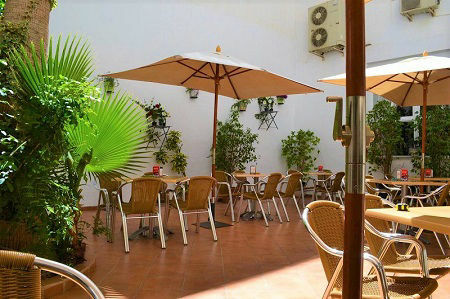 An pleasant older tyle traditional little B&B hotel, just 4 minutes walk from the Poniente beach in a quiet street in the old town. Simple basic rooms and friendly welcoming staff. Ideal for for a cheap beach weekend in Spain, on a budget with friends. Cheap no fuss with good showers and a lovely café bar too! 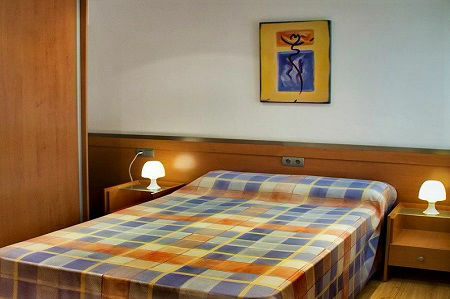 A budget little 1 star hotel with clean cheap rooms from 25€ per night. Perfect for a basic no-frills stay that will cost very little. Very friendly owners who make you really welcome. Popular for a few nights. 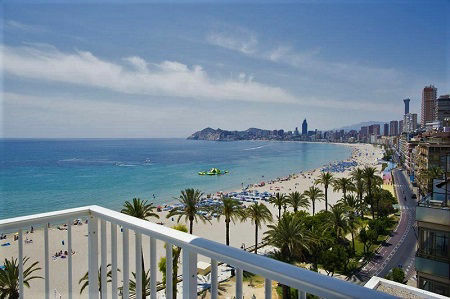 A great option for a cheap week or short break in Benidorm is to book a good value tourist apartment. This gives you more space than most of the budget hotels and can be a really affordable option when there are more than two of you. Can be fun to share. 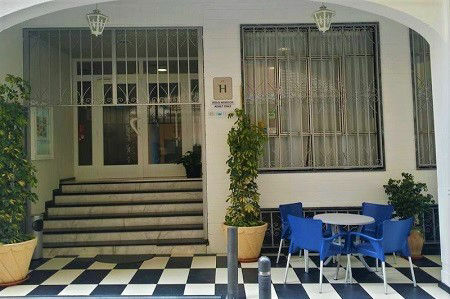 Smart little bed and breakfast guest house in the center of Benidorm old town. Offering a superb location for the old town bars, restaurants and beach withe direct accessed via steps 40m from the Irati. Only 8 rooms book early! 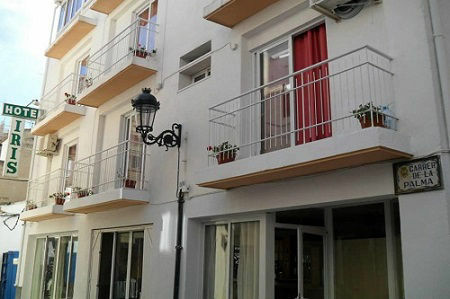 Cheap rooms just 250m from the Playa Levante in the busy old town. Ideal for a no-frills budget stay in Benidorm. 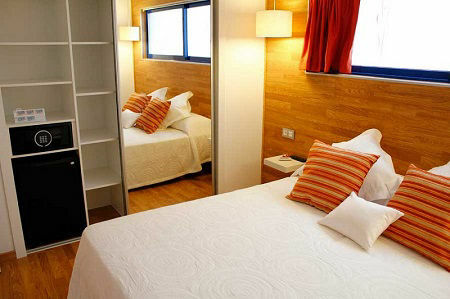 If you are looking for a cheap hotel then the Orozca Pension offers you basic no frills budget rooms. OK for singles, couples and groups. 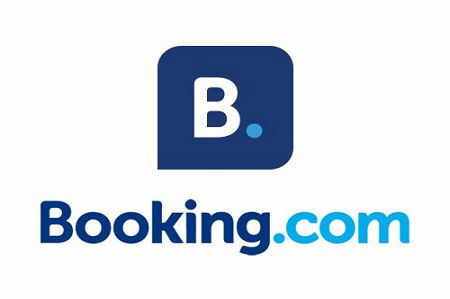 When it comes to cheap deals in little hotels, hostals, pensions and guest houses booking.com. have more choice than any other site. Superb quality Guest House in the very center of the old town. 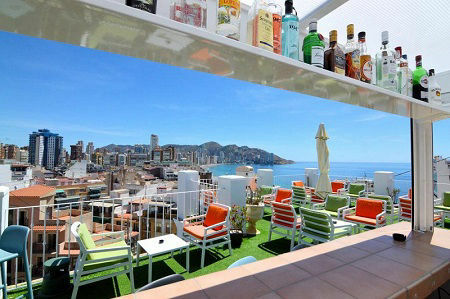 A vibrant, late an lively area, perfect for a cheeky few fun nights in Benidorm. Good for singles or couples. Gay Friendly late bar. Located seconds from restaurants, cafés, and Tapas Alley! ADULT ONLY.